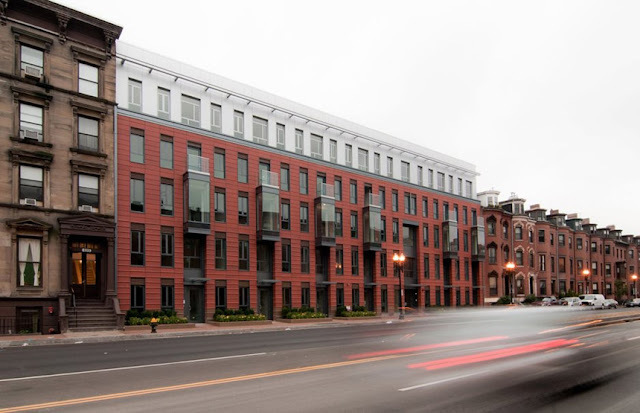 For the past few years, Urbanica has worked closely with Studio Luz, the South End Landmarks District Commission and the Boston Redevelopment Authourity in developing an exceptionally sensitive and contemporary building on 691 Massachusetts Avenue. 691 residences is one of the last new-built developments in South End, Boston, with approximately 45,000 sq ft of space including the basement garage.There are 40 residential units, ranging from 550sf to 1800sf with unit types including studio, one bedroom, one bedroom plus and two bedrooms residences. There are also 30 deeded parking spaces. This property fills a long vacant gap in a line of historic brownstones along Massachusetts Avenue. Urbanica’s unique vertically-integrated structure allowed an assurance of quality and efficiency of cost and time by coordinating the project from in-house design of core and shell to partnering on the façade with Studio Luz Architects and through development, marketing, and construction. This project is exemplary of Urbanica’s commitment to the revitalization of underutilized parcels in up-and-coming urban neighborhoods.Our firm is extremely proud of the project and the close cooperation we had with the neighborhood and city. Welcome to our blog, we will be updating our supporters and followers with news and updates on our future and past projects!